CLAYTON – The St. Louis County Government presented its first-ever Business Diversity Report for the 2018 fiscal year to the public on February 27th. The report was published after Griffin & Strong PC, an attorney and public policy consultant based in Atlanta, Ga., completed a Disparity Study on behalf of the County. Ethel Byndom was in charge of ensuring that the study got completed. 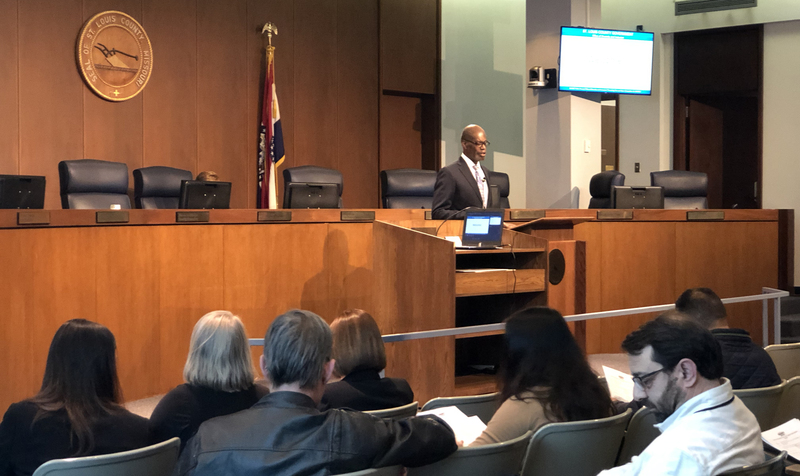 Within the report, presented by Jack Thomas, Jr., chief diversity officer for St. Louis County, Thomas labels the future goals of the department’s employment as well as its outreach to the minorities, women, and residents of the County. Thomas was hired in July of 2018 by Stenger. Hayes said that since Thomas’ employment, he has made sure that contracting firms are aware of his open door policy regarding their concerns. The department already hired Deputy Director of Procurement, Reneé Medlin Schumacher and hopes to hire two Contract Compliance Specialists for 2019. County Executive Steve Stenger requested $1 million be budgeted to the department to cover the costs of the Disparity Study update, workforce goals study, professional trainings, and employment. Thomas said the costs were determined by looking at other studies done by other departments and the assistance of the County’s Budget Division. Thomas also mentioned created a Minority Business Development program with Tuck University by bringing the university to St. Louis, identifying specific firms that could benefit from the training, and partnering with other organizations to help offset some of the costs. Additionally, Thomas said the department will continue its construction and construction-related services to build the foundation for an inclusive procurement process. The steps in completing the department’s action plan for 2019 include identifying barriers to MWBE participation; completing program policies and procedures; implementing a comprehensive monitoring and enforcement mechanisms; expanding the program; expanding and increasing outreach efforts; Model Contractors Development program; and establishing benchmarks for County Departments. Hayes shared that Paric has an “outstanding” working relationship with Thomas. The firm has attended multiple outreach sessions hosted by Thomas and the county’s Diversity and Inclusion Department, as well as duties that Thomas performed in St. Louis City. Currently, the department is not at the point of adding feedback from MWBE participants into the study, but Thomas said it hopes to be there soon. Those inconsistencies were for all minority, women, veteran, and service disabled veteran-owned businesses.